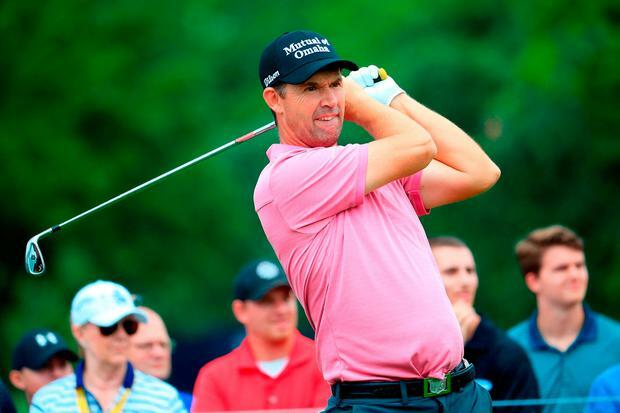 Pádraig Harrington might not be part of the major championship conversation these days, but that doesn't mean he's given up hope of winning what will the final edition of the US PGA as 'Glory's Last Shot'. Harrington can hardly believe that ten years have passed since he holed that par putt at the 18th at Oakland Hills for his third major win in 13 months. But as he reflects on the decade that's gone by and the 17 years that have elapsed since the 9/11 terrorist attacks on the World Trade Centre forced organisers to cancel the 2001 American Express Championship at this week's venue, Bellerive Country Club, he's happy in his skin. "Ten years, wow, it's gone quick," he said. "But I've enjoyed it. It's hard to believe it's been ten years!" The big themes this week are Tiger Woods' bid for that 15th major, Rory McIlroy's struggle to get to five, Jordan Spieth's second attempt at completing the career Grand Slam and the race for Ryder Cup spots on both sides of the pond. Set to turn 47 in three weeks' and without a top-10 finish in a major for six years, Harrington knows he's not expected to contend. But that doesn't mean he's just turning up to make up the numbers as he showed with his enthusiasm for a money match alongside Shane Lowry against Rich Beem and Tommy Fleetwood yesterday. Beem called Harrington and Lowry out on social media last week, and the Dubliner was determined to make sure he got full value for his money. "I only heard about that this evening," he said with a laugh after spending several hours grinding on the range in search of the perfect shaft for his driver. "But I'll want it to be forfeit - losers have to shave their head." Whatever about his game, Harrington is comfortable living in that twilight zone between being a contender and a former champion. "Yeah," he said. "But look, there are two sides to it. I am here to enjoy what I have done but also to compete. I have an eye on both. I am not here for the party either, but I am here to enjoy it." When asked about his marathon range session in the sweltering heat on Monday, he shrugged. "That was just a normal one," he said. Harrington didn't see the course until he arrived late for the money match yesterday. "Let's face it, you could turn up with a yardage book on Thursday and play this course and you'd be fine," he said, running to the tee to cut in ahead of Rickie Fowler and Justin Thomas as they waited for Jordan Spieth to arrive. "Sorry lads, I'm just trying to catch up the guys in front," he said before lashing his driver up the fairway on a day marked by two long delays for torrential rain and thunderstorms. When it comes to new technology, he's not nearly as alarmed as Nick Faldo, who was aghast at Rory McIlroy's 420-yard drive at Firestone's 16th on Sunday. For Harrington, the ultimate analyst, it's not that big a deal. "Well, the ball always goes a long way at Firestone," he said. "And 181 mph ball speed on the range at The Open was only going 260." He doesn't wish he was 29 again or wonder what he'd have become had he grown up in California practising in balmy calm conditions. "I wouldn't be the player I am," he said. "If I grew up playing in a nice sunny climate with no wind on the practice ground, yeah, you'd hit the ball better. But you wouldn't have the short game or the mentality I have. Any kids watching the coverage now will wonder what 181 ball speed means and think, 'Ok, I have to get 181 ball speed.' And he will do it. It's not that hard." Comparing long drive specialist to 100m athletes, he did some mental arithmetic and reckoned that tour players were running "a 12-second 100m" not 9.75 secs. It's a different world now to the one he left behind at Bellerive in 2001 when those planes hit the World Trade Centre. "It was a Tuesday," he recalled. "I was in a car listening to it. I didn't even come close to comprehending what it was. It was 15-20 minutes before the relevance of it started to kick in. It changed the world for sure." What hasn't changed is the importance of the Ryder Cup, and, while Harrington knows that Thomas Bjorn would like to see players like Sergio Garcia find form, he has no fears for Rory McIlroy, despite the angst over the Holywood star's four-year major drought. Once criticised himself for racking up the runner-up finishes before exploding into major-winning form, he hopes people can remain patient when it comes to the Co Down man. "You are going to get hung out, and you are going to have your day," he said of the importance of McIlroy's unquestionable ability to contend. "All you have to do is compare him to all the guys who have won majors. "They don't win one a year. They don't win four in a year. Literally, it takes them 20 years. So he's got another ten years of doing it." FANS have reacted with a mixture of frustration, bemusement and dismay on social media as US PGA host broadcaster Eleven Sports was slow to advertise its coverage or reveal details on how to watch – and then asked those who want to sign up for credit card details despite the action being billed as ‘free’. The event will not be shown on the traditional TV stations but instead on the website and Facebook page of the online streaming service founded and controlled by the Leeds United owner Andrea Radrizzani. It is understood that Eleven Sports has paid a seven-figure sum for the one-year deal, which it will use to launch its UK service that will show live La Liga and Serie A football. Anyone who wants to watch all four days is obliged to subscribe and set up an account including payment details for either a €6.99 monthly or €59.99 annual pass, but can then opt out before Monday’s deadline.